(Bloomberg) -- On an unusually warm day in northern California, hot and dry winds whipped through the Sierra Nevada foothills northeast of San Francisco. It was Thursday, Nov. 8, and a "red-flag warning” from the National Weather Service was already out, cautioning that the chance for a wildfire was high. 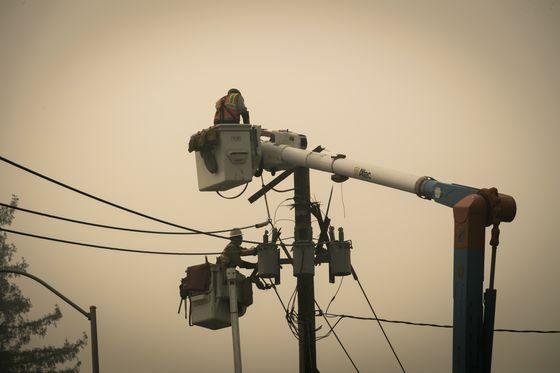 The caution quickly proved true -- a PG&E Corp. worker reported the first flames around 6:30 a.m., near one of the utility’s transmission towers close to Camp Creek Road. 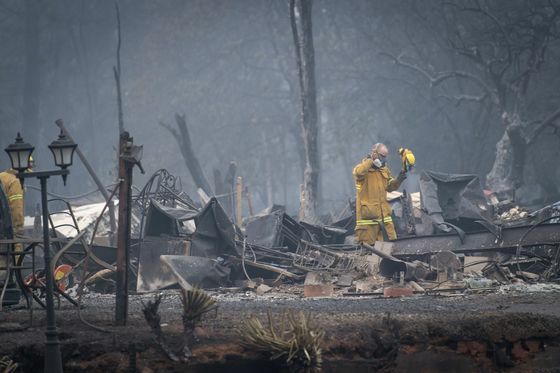 By 8 a.m., the blaze -- ultimately known as the Camp Fire -- entered the community of Paradise. The flames would eventually destroy the town, and would take weeks to bring under control. Eighty-six people died, almost 20,000 structures were destroyed, and more than 153,000 acres were gutted. 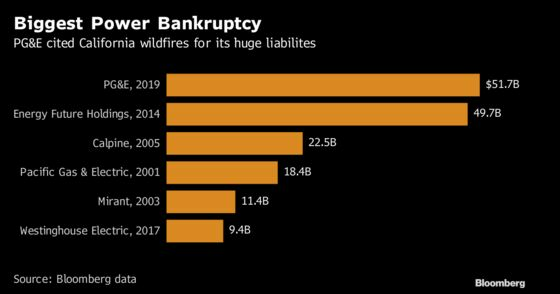 And, just 82 days after the fire began, California’s largest utility would declare bankruptcy. 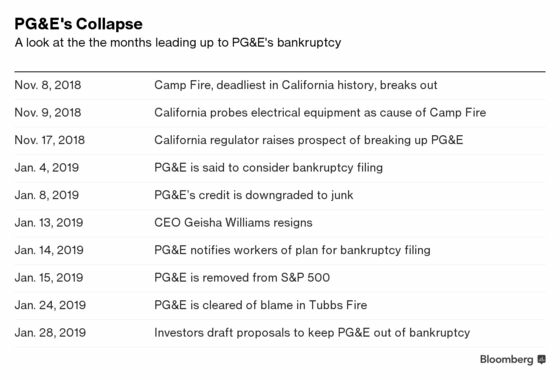 On Tuesday, with its shares down 71 percent since Nov. 8, PG&E cited an estimated $30 billion in potential liabilities from that fire and others in the biggest utility bankruptcy in U.S. history. 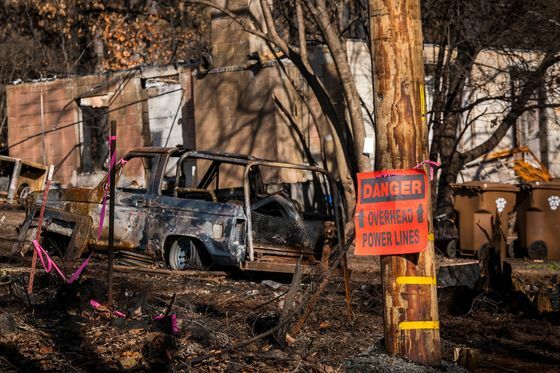 The main culprit, according to the filing: The state’s inverse condemnation law, which holds utilities responsible for wildfire damage caused by their equipment, whether the companies acted negligently or not. In some ways, PG&E Chief Executive Officer Geisha Williams was prescient about her company’s eventual decline and fall. In March, she joked that she wouldn’t have her job in two years if she didn’t find a legislative fix for the inverse condemnation law. It needed changing, she said, because utilities weren’t the real reason behind the rising number of wildfires in the state. Instead, she blamed global warming, saying it was drying out large swaths of California, making the fire season more extreme. To make its case, PG&E hired nearly every available lobbyist in the state, and even got then-Governor Jerry Brown to join its call for a change. But the legislature wouldn’t bite and, eventually, the best the utility could get was a measure designed to help utilities pay for massive wildfire liability in 2017. Meanwhile 2018, the year of the Camp Fire, remained unresolved. Williams was ultimately right about the threat from the law and her survival in the job. But she was wrong on the timing: Just sixteen days before the company filed for Chapter 11 protection, she was ousted as CEO. The story of PG&E’s response to the Camp Fire is complicated. On the day the blaze began, the company filed a brief incident report noting that a transmission line had gone offline about 15 minutes before the blaze was discovered. Later, the utility would report that it found a flash mark close to where the fire began. Nearby was an insulator that had separated from a tower arm, the company said. Investigators have yet to determine a cause of the Camp Fire. Days after the first brief incident was filed, Williams and her executive team held an all-hands meeting with employees. The executives reviewed the report but didn’t speculate on the cause of the fire, according to employees who attended the meeting. Instead, Williams spoke about witnessing the devastation in the town of Paradise, and about the need for PG&E to be a “humbler” company. When she opened the call up for questions, one employee asked if the executives could say what caused the fire. Williams said they had already dealt with that question, but the employee recalls thinking that the company hadn’t really addressed it at all. As the shares continued to fall, talk of bankruptcy and of leadership changes began in earnest. The company hadn’t endeared itself to state regulators after a 2010 natural gas pipeline explosion that killed eight in a suburb of San Francisco. And it was already being sued by homeowners for the deadly Tubbs fire that broke out in northern California in 2017, although the company would ultimately be cleared of responsibility for that blaze by California investigators. Michael Picker, the head of the state’s Public Utilities Commission, at one point openly suggested that the company needed new leadership. 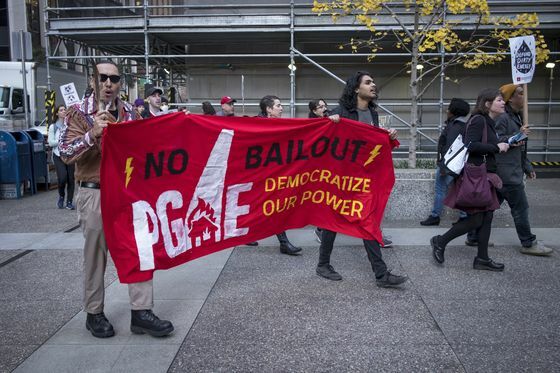 Meanwhile, protesters interrupted a series of CPUC meetings with cries of of “perjury” and “murder.” Their message: The state shouldn’t bail out PG&E; instead, it should take the company over. The San Francisco-based company initially looked to Sacramento for help, after a lawmaker in late November said a bill was being planned to extend the 2017 liability legislation to cover 2018 as well. But by January, as public outrage swelled and a new governor was sworn in, it became clear that lawmakers had little interest in throwing the utility a lifeline. On Jan. 8, PG&E announced three top executives would be leaving, including Patrick Hogan, senior vice president of electric operations at the company’s utility unit. It was a move seen as trying to address the calls for a management shakeup. Five days later, Williams, one of only about two dozen women in charge of an S&P 500 company, was gone as well, after just under two years on the job. Some of the biggest names in the investment world would offer last-minute rescue packages to keep PG&E out of a restructuring, including Paul Singer’s Elliott Management Corp., Ken Griffin’s Citadel LLC and Leon Black’s Apollo Global Management LLC. But in a filing on Tuesday, Chief Financial Officer Jason Wells said Chapter 11 protection represented "the only viable option to fairly and expeditiously resolve PG&E’s wildfire liability, to restore PG&E’s financial health and stability, and to make sure that PG&E has the liquidity and resources to fund its operations."